Mormon Wookiee: #88: True Love: Katie Kirkpatrick and Nick Godwin. #88: True Love: Katie Kirkpatrick and Nick Godwin. The photo instantly caught my attention. 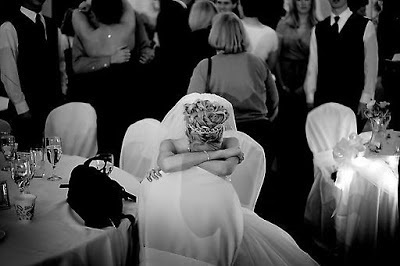 Even though the bride in the picture is clearly ill, she just seemed so beautiful to me, and you could tell how much she and her new husband loved each other. I decided to learn more about the couple, and their story touched my heart more than anything has in a long time. I wanted to share the story of Katie Kirkpatrick and Nick Godwin with you in case you had not seen it before. All black-and-white pictures were found at Katie's Facebook Tribute Page and were originally taken by photographer Romain Blanquart. 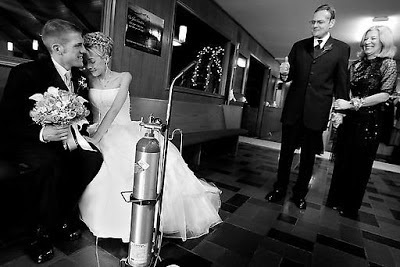 One year later, on Valentine's Day, 2002, while a freshman at Rochester College in Michigan, Katie was diagnosed with a malignant brain tumor. The next year she was also diagnosed with an inoperable lung tumor. Her high school sweetheart, Nick Godwin, supported and stayed by Katie's side the entire time. Despite Katie's continually declining condition, Nick proposed and Katie accepted. "It was wonderful. It was a dream come true. She was the most beautiful angel ever—just caring and selfless, and such an inspiration to everyone. She was always smiling no matter what happened, no matter what news she got. She was as close to perfect as they come." Katie and Nick's Wedding Ceremony. 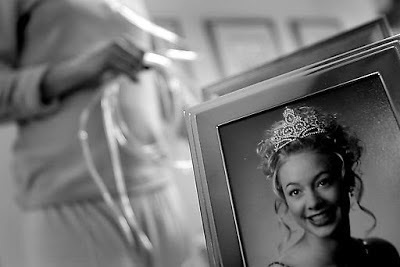 Katie walks past a picture of her as Homecoming Queen a few years earlier. 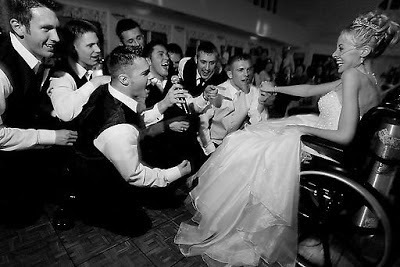 Nick and his best men serenade Katie in her wheelchair. Katie puts in her earrings as the finishing touches to her wedding dress. Katie and Nick share a moment with Katie's parents. Katie with her dad, Dave Kirkpatrick. An exhausted Katie takes a break during the wedding dinner. Katie in pain prior to the wedding. 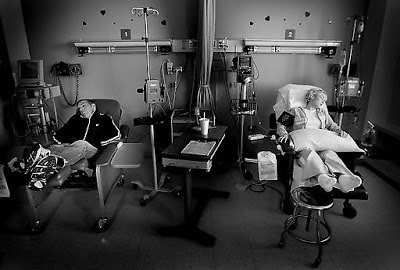 Nick and Katie during a long day at the hospital. procedure just eight days before the wedding. I am so touched by Katie and Nick's story. As I thought about their all too brief marriage, it caused me to pause and think about my own marriage to Diane. It made me so grateful for her. It made me want to try harder to be the best husband I possibly can and cherish every day with her. It also made me grateful for the knowledge that because of the restored gospel of Jesus Christ, I have the opportunity to be married to Diane for eternity and not just until "death do us part". There is no greater blessing I can imagine. I pray for the same blessing for Katie and Nick. Katie and Nick's example is a powerful reminder to me to try to love with all of my heart, because as Katie said in her graduation speech, there really is nothing more important in life than that. God bless you, Katie and Nick! What a touching couple...so many emotions right now I don't even no where to start. My prayers to her husband, family and friends. I loved this story the first I read about it a few months ago; such wonderful examples of loving wholeheartedly and devotion. I think I saw these two on one of the national morning news programs and the show gave her a make-over or something to help with the wedding, etc. I had not heard that she died five days later. So sad. Sounds like these two valued marriage. More-so than most of us. Beautiful story. Great example. I am or inspired by them. I want to make each day count. Her story is being made into a film very soon. That is awesome! I can't wait to see it. She and Zach Sobiech are two of my greatest role models. Live life to the fullest.